^ Engel, David (2015). 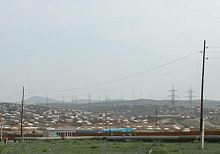 "Ulaanbaatar's GerDistrict Issues: Changes and Attitudes". School for International Training. Retrieved 20 June 2016. ^ Ulaanbaatar Statistical Office. 2008 Annual Report. Population data as of 01-01-2009. Sheet "HH type UB"